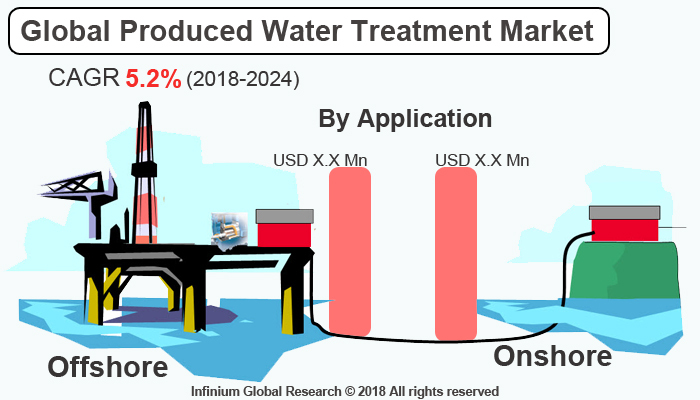 A recent report published by Infinium Global Research on produced water treatment market provides in-depth analysis of segments and sub-segments in global as well as regionally produced water treatment market. The study also highlights the impact of drivers, restraints and macro indicators on the global and regional produced water treatment market over the short term as well as long term. The report is a comprehensive presentation of trends, forecast and dollar values of global produced water treatment market. According to the report the global produced water treatment market is projected to grow at a CAGR of 5.2% over the forecast period of 2018-2024. Produced water treatment is set of processes done on the Produced Water to obtain usable water for the various applications including domestic, livestock watering, industrial, commercial, agriculture irrigation, fisheries, wildlife, and many others. The produced water is the term used for the wastewater that is produced during oil or gas extraction. The Produced water is bought to the surface along with the oil and gas during their extraction. The produced water has a complex composition and contains various organic and inorganic toxic compounds. The rapidly growing Oil and gas extraction activity and presence of developed oil and gas field across the world drives the growth of produced water treatment market. The produced water is injected back into the reservoir in order to enhance the recovery operation of the well and maintain the right pressure in the well. In addition, strict environmental rules and regulation on the factors associated with the produced water treatment are contributing to the growth of produced water treatment market. However, the factors like lack of public acceptance and complexity of treatments are restricting the growth of the produced water treatment market. Furthermore, the reuse of produced water, ongoing advancements in water treatment technologies are anticipated to boost the growth of the produced water treatment market. Moreover, the rising Oil & Gas Operations and the use of produced water for the various industrial as well as domestic applications are projected to create several opportunities for the produced water treatment market. Among the geographies, North America region holds the maximum market share in the produced water treatment market. The ongoing shale gas developments and the growing use of produced water in commercial, industrial and agricultural irrigation applications in the U.S is driving the growth of produced water treatment market in the North America region. In addition, the Asia Pacific region is the fastest growing region in the produced water treatment owing to the rapidly growing oil and gas extraction activities and the unavailability of serviceable water. The report on global produced water treatment market covers segments such as treatment type, technologies, and application. On the basis of treatment type, the global produced water treatment market is categorized into physical, chemical, membrane and others. On the basis of technologies, the global produced water treatment market is categorized into onshore and offshore. On the basis of application, the global produced water treatment market is categorized into primary separation, secondary separation, tertiary separation, and others. The report provides profiles of the companies in the global produced water treatment market such as Baker Hughes Incorporation, Fmc Technologies Inc., Halliburton Company, Ovivo Water Ltd., Siemens Ag, Veolia Environnement, Schlumberger Ltd., Enviro-Tech Systems, General Electric, and Halliburton Company. The report provides deep insights on demand forecasts, market trends, and micro and macro indicators. In addition, this report provides insights into the factors that are driving and restraining the global produced water treatment market. Moreover, IGR-Growth Matrix analysis given in the report brings insight into the investment areas that existing or new market players can consider. The report provides insights into the market using analytical tools such as Porter's five forces analysis and DRO analysis of produced water treatment market. Moreover, the study highlights current market trends and provides forecast from 2018-2024. We also have highlighted future trends in the produced water treatment market that will impact the demand during the forecast period. Moreover, the competitive analysis given in each regional market brings insight into the market share of the leading players. This report will help manufacturers, suppliers, and distributors of the produced water treatment market to understand the present and future trends in this market and formulate their strategies accordingly.